This activity uses common large carrots and two different metals to make a enough electricity to run a small digital clock. Materials: Two Large Raw Carrots; 2 Pennies; 2 Large Galvanized Nails; 3 pieces of 6" long wire; Small Digital Clock from good electrical suppliers, or ebay! around £3 ($). The digital clock can be extracted from an inexpensive alarm clock or it can be purchased from an electronics store. Slice of about 1 inch from each carrot and discard. Place the remaining pieces next to each other, flat face down on a plate. Strip off about 2 inches of insulation from both ends of each wire. Wrap one end of one wire around one of the nails. Press the nail into one of the carrots pieces. Wrap one end of another wire around one of the pennies. Do this by first laying the penny across the exposed wire. Position the penny so it is centered on the wire and almost touching where the wire insulation begins. Fold the end of the exposed wire over the top of the penny. Pinch the penny and wire between your index finger and thumb on one hand and pinch the overlapping wire with the other hand. Twist the penny until the wire tightens around the penny. Press the edge of the penny about half way into the other carrot. You could drill holes in the pennies to make it easier to attach the wires. Insert the nail into the carrot that already has the penny stuck into it then stick the penny into the carrot that already has the nail stuck into it. Pop the back off the timer and remove the button battery. Connect the two wires coming from the potato battery to the contact on the battery holder. If the clock does not illuminate the polarity (+ / -) might be incorrect. Touch the wires to the opposite contacts on the timer's battery holder. The carrot contains phosphoric acid. This acid causes chemical reactions to occur at each of the electrodes (galvanized nail and copper penny). The reaction at the copper electrode strips electrons from the copper and attaches them to the Hydrogen ions (2H+) in the phosphoric acid. This depletes the electrons on the copper electrode which makes if "hungry" for more. The process creates Hydrogen gas. The galvanized nail provides the Zinc needed for the other reaction. The reaction at the galvanized nail dissolves the Zinc. The dissolving process strips electrons from the Zinc atoms. The liberated electrons stay on the electrode and the resulting Zinc ions (Zn++) migrate into the acidic juices of the potato. This results in an excess of electrons on the Zinc electrode. 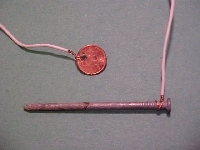 If a wire is connected between the Zinc nail and the copper penny, electrons will flow. This flow of electrons is the electrical voltage. When the battery was connected to an oscilloscope and measured a voltage of 0.5 Volts. 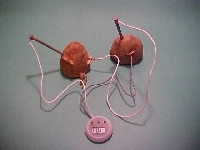 Several carrot batteries can be connected in series to generate a higher voltage.